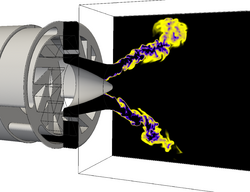 Direct Numerical Simulation of an aeronautical burner . The mesh features 2.6 billion tetrahedrons and a resolution of 100 microns. 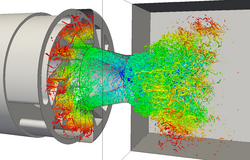 Large-Eddy Simulations of a swirl burner designed and operated at CORIA (J.P. Frenillot, G. Cabot, B. Renou, M. Boukhalfa). Large-Eddy Simulation and Direct Numerical Simulation of flame kernel development in a stratified propane/air mixture. The turbulent simulation (left movie) reproduces the experimental measurements of Balusamy S., Lecordier B. and Cessou A. from CORIA. 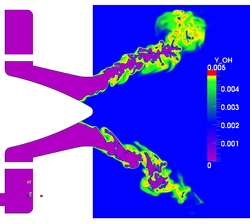 2D Large-Eddy Simulation, injection of a premixed kerosene/air mixture on the left with a high level of turbulence. Some kerosene droplets are added to this premixing. 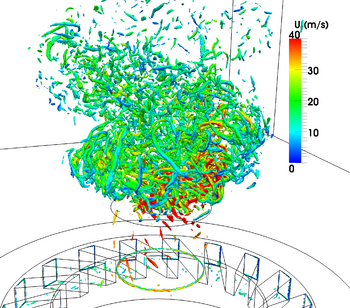 3D simulation of the MERCATO burner under reactive conditions. Particles are two-way coupled with the gaseous phase. 3D simulation of the MESOCORIA burner under reactive conditions: H2/CH4/air. Computation of a Formula 1 meeting with the 2010 regulations. 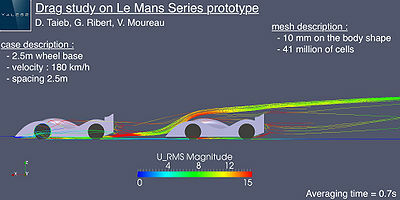 The design is based on the 2008 car which was simulated with the Fluent software with less than one million cells. The new car has the main features observed during the early part of F1 season, like the coca bottle shaped sidepods, the double-deck diffuser, the outer mirror disposition (forbidden by the FIA in the second part of the season), the three elements front wing. 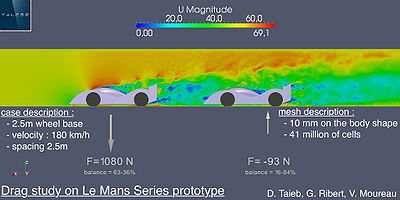 The body of the car is discretized with 6.5mm element leading to 36 M cells in the computational domain. 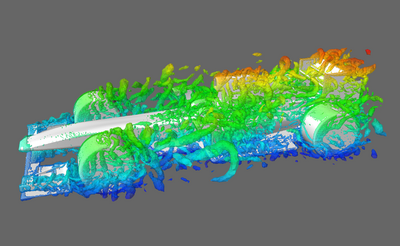 Large-Eddy Simulation of heat exchanges on a turbine blade. Computation of a Triple Disk injector (Grout et al 2007). The densities and viscosities are those of water and air at atmospheric pressure and temperature. The video on the left was performed with 203 million tets and the one on the right with 1.6 billion tets with a resolution of 2.5 microns. 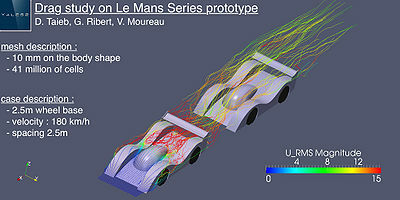 Sample computation of a 2D two-phase flow with realistic properties for air and water to highlight the robustness of the method developed by Desjardins and Moureau at the 2010 CTR Summer Program. 2D computation with YALES2 of a Lagrangian spray splashing on a wall and forming a film modeled with a level set and the Ghost Fluid Method. The grey particles and the grey film have the properties of water and the color represents the velocity magnitude in the gas. The Lagrangian particle are one-way coupled to the gas through drag for sake of simplicity. 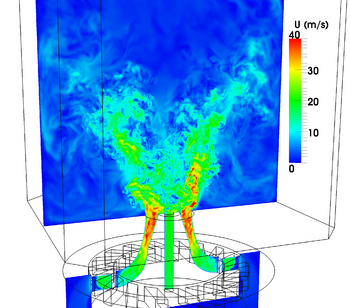 3D simulation of the MERCATO burner under isothermal conditions. Particles are two-way coupled with the gaseous phase. The mesh consists of 326 million tetrahedra. Velocity magnitude (top) and evaporated fuel mass fraction (bottom) are displayed in the mid-plane. 3D computation of a cardiac cycle with the Arbitrary-Lagrangian Eulerian solver of YALES2. 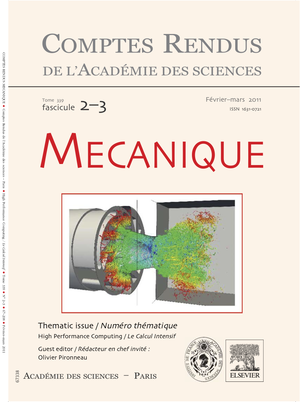 This solver and the calculations were done in the I3M lab of the University of Montpellier by C. Chnafa, S. Mendez and F. Nicoud. The color in the movie represents the vorticity. The grid on which the fluid problem is computed is extracted from 4D (3D + time) medical images from a patient. Ten 3D images are taken from different times during the heart cycle. A grid is extracted from one medical image using a segmentation protocol. Then, grid deformations are computed from the combination of an image registration algorithm and of interpolations process. Hence, boundary movements are extracted from medical images and applied as boundary conditions for the fluid problem, resulting in a patient-specific computation. The spatial resolution is imposed to be close to 0.8 mm in all three spatial directions along the cycle, which yields grids of approximately three-million tetrahedral elements. Valves are modelled by immersed boundaries, and the heart is handled by a conformal mesh. These results are obtained with the granular flow solver of YALES2 developed during the PhD thesis of Y. Dufresne funded by the ANR project MORE4LESS coordinated by IFP-EN. 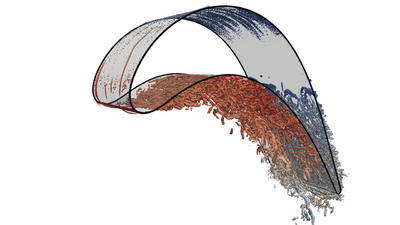 The flow solver is highly scalable and enables to perform simulations of the settling of 10 million soft spheres on 512 cores of the Curie machine (GENCI, CEA). 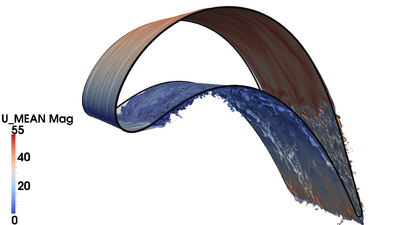 On the left, 2D computation with YALES2 of the flow around two moving cylinders with an immersed boundary technique implemented for unstructured grids. The color represents the velocity magnitude. 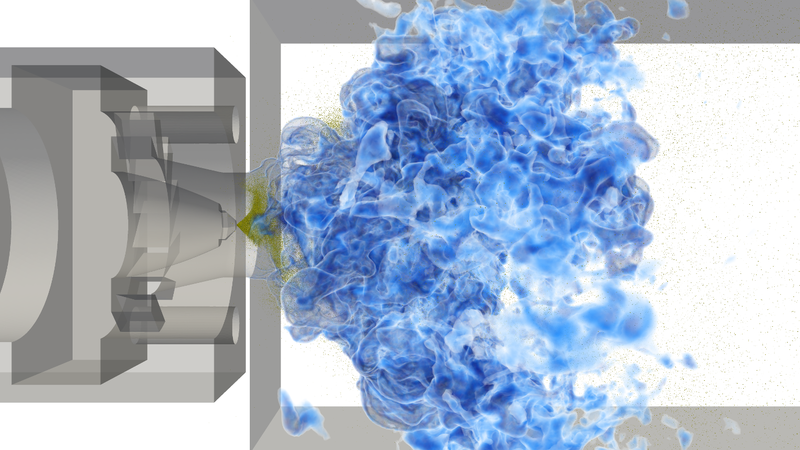 On the right, simulation of a stirred-tank reactor with YALES2. The mesh consists of 31 million tetrahedra. 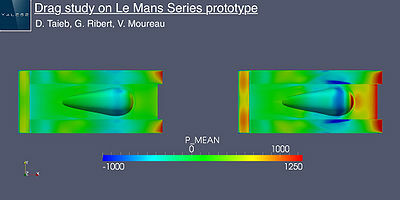 Simulation performed by V. Moureau from CORIA and N. Perret from Rhodia-Solvay. Demonstration of 2D and 3D dynamic mesh adaptation with YALES2. 2D remeshing is based on in-house Delaunay triangulation and 3D remeshing is based on the MMG3D library developed by C. Dobrzynski at INRIA. This page was last modified on 22 March 2016, at 02:39.